American Quilt Retailer is returning with Better Homes & Gardens American Patchwork & Quilting for another Schoolhouse Series at this spring’s Quilt Market! The Spring International Quilt Market is May 18-20 in Portland, Oregon, and the Schoolhouse Series will feature three classes on Thursday, May 17. Editor of AQR and shop owner Heidi Kaisand will be joined by editor of American Patchwork & Quilting Jody Sanders and Roseann Kermes to feature three classes. The first class of the Schoolhouse Series covers something we all wish we had more of; time. Owning a small business can make it difficult to reach business goals and often interferes with our personal lives. This session will cover organizing, delegating, and making essential decisions to run your business. The second session is as dynamic as the people running it. Editors Kaisand and Sanders will cover information for consumers and shop owners alike through topics like color options and products to inspire customers. Lastly, Heidi Kaisand is again joined by Roseann Kermes to share how to make a staff operate like a well-oiled machine. A team that works well together makes victories so much easier to obtain, and thus an even more successful business that everyone can reap the benefits from. Finally for the part you’ve all been waiting for… AQR is happy to announce the now-legendary blue bags are back, and the first 400 people to attend the Schoolhouse Series will receive one filled with information and product in exchange for a business card. 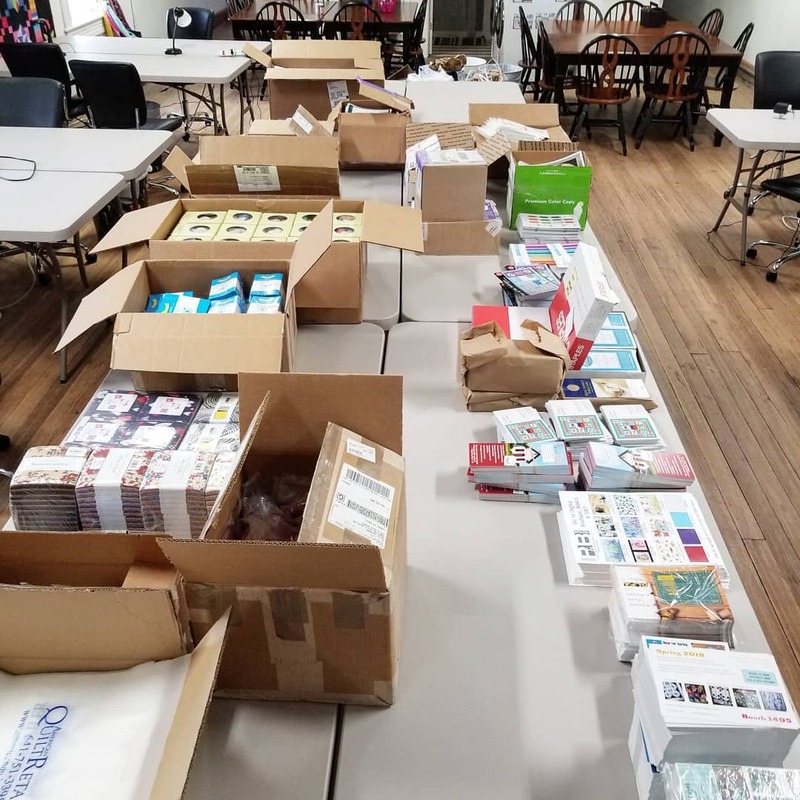 Just some of the product to be featured in the blue bags AQR will hand our during their Schoolhouse Series at the Spring International Quilt Market in Portland Oregon. If you so happen to be sticking around the Quilt Market, feel free to stop by American Quilt Retailer’s booth at 839 and talk to editor Heidi Kasiand about how we can make the issue better for you. We love feedback—and conversations with other small business owners, too.